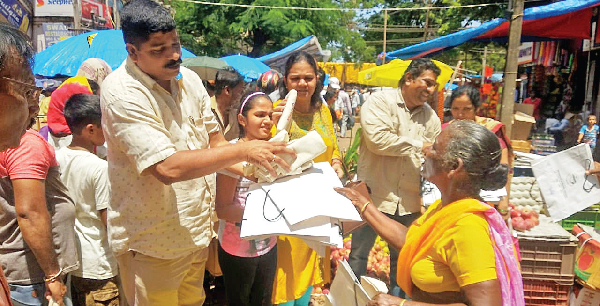 In a bid to promote a plastic-free Ganesh Chaturthi, Mormugao Municipal Council (MMC) distributed around 5,000 cloth and paper bags to vendors and public at Vasco Market on Wednesday morning. The bags were distributed free of cost ahead of the Ganesh Chaturthi festival. MMC Chairperson Bhavna Nanoskar along with Councillors Kritesh Gaonkar, Saifullah Khan and Dhanpal Swamy distributed the bags in the busy market where a large crowd had gathered to buy vegetables and fruits for their Matoli. Speaking to reporters, MMC Chairperson Nanoskar said the council was dedicated and wanted to ensure that Ganesh festival would be plastic-free on the same lines of the recent Damodar Bhajani Saptah Fair. “I think we will surely be successful if people cooperate with MMC. I think all municipal councils across Goa should adopt such procedure so that plastic menace in Goa can be reduced by a big extent,” said Gaonkar. MMC Chief Officer Agnelo Fernandes thanked Kotak Mahindra Bank for handing over 2,000 cloths bags to the MMC as part of its CSR activities. “I appeal to all the women and self-help groups to join hands to make this initiative a reality. They can collect old sarees and we can ask the 260 SHGs registered with us to come forward to prepare cloth bags which can be supplied to people. I also want help of all shopkeepers not to keep plastic bags and in turn start reusing paper bags to pack material,” said Fernandes.